This great episode of Sea Watch UK sees Andy Ford heads to the Isle of Whithorn in southwest Scotland for some great ‘shark’ fishing…. 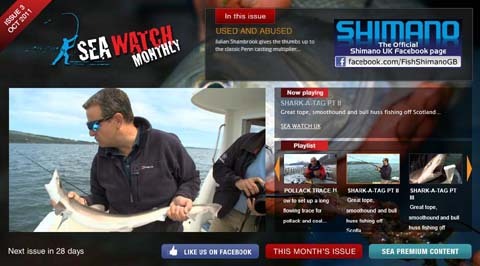 And it’s FREE TO VIEW in the October issue of Sea Watch Monthly – the video magazine for shore and boat anglers. 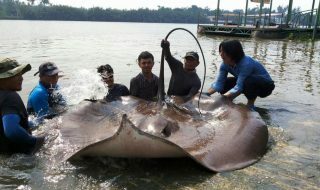 Andy is joining the anglers involved in Sharkatag, an important Sea Anglers Conservation Network event that highlights the need for shark, ray and skate conservation. He is joined by Willy Kennedy and Stuart Cresswell, who show him the ropes in his efforts to catch personal best tope to 40lb, bull huss, rays and smoothhounds. The boys are up-tiding and down-tiding in running tides for some absolutely superb fish on marks up to 50 metres deep aboard the boat ‘Reel Deal’, and of course the fish are all tagged, measured and returned to fight another day. The anglers show how to fish with peeler crab and mackerel baits using barbless hooks, while Ian Burrell explains how the commercial fleets have been decimating the ray and shark species populations, and the progress made by the Sharkatag teams in the last few years. 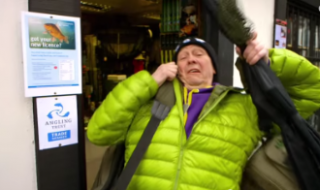 Great fishing as Andy bids for his shark ‘Grand Slam’ and a real education in the need for catch and release fishing and the plight of fish like the tope, which are still not protected by Scottish law.